Senior attacker Andi Raymond started aggressively and fueled a 12-2 win over the Elon Phoenix on Friday night, but it was her first of three goals that stood out. Raymond took a free position shot from the left side and fired it past the Elon goalie to hit goal No. 100 for her career. She became the 10th Towson women’s lacrosse player to hit 100 goals in a career. The win came after two consecutive losses to No. 14 Penn and No. 18 Loyola. Head Coach Sonia LaMonica said Raymond helped the team get back on track. Raymond put Towson on the board first just over 90 seconds into the game. She beat Elon goalie Rachel Ramirez to put the home team up 1-0 early. The goal also meant she passed Kim Wilson for ninth on the all-time scoring list. Raymond continued on the offensive, scoring less than three minutes after her first goal. 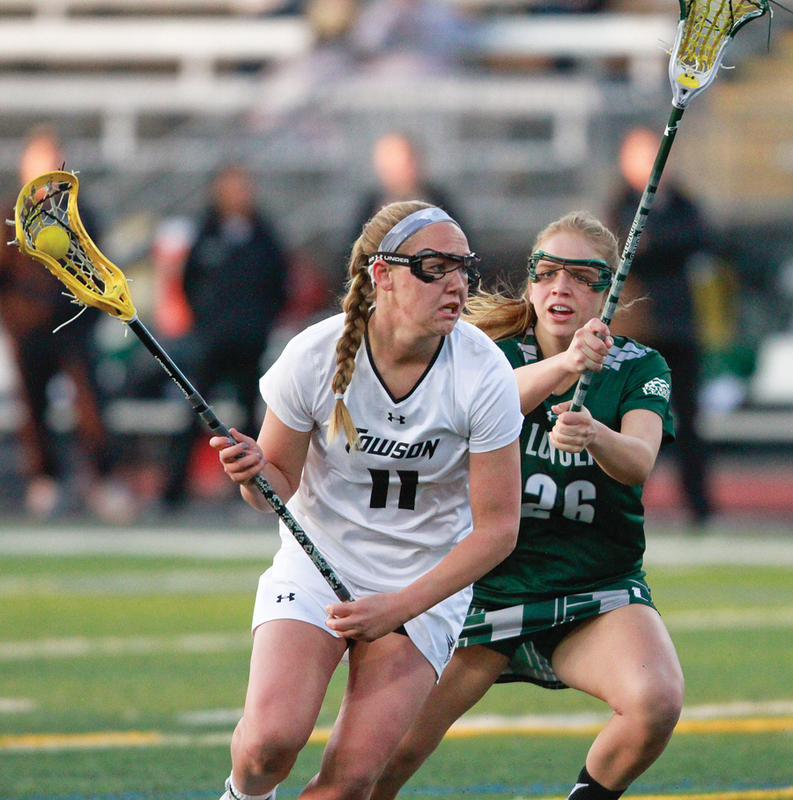 A few minutes after that, Towson took a 3-0 lead when senior attacker Sarah Maloof found freshman midfielder Kaitlyn Montalbano off a free position attempt and Montalbano finished. The Tigers continued to pressure the Phoenix throughout the first half. Raymond made it a hat trick with 19:05 left in the half and then found sophomore attacker Gabby Cha, who scored to make it 5-0 just under four minutes later. Elon got on the board with 9:58 remaining in the first half, when attacker Nicole Sinacori beat Towson goalie Kelsea Donnelly on a free position attempt to cut the lead to 6-1. Senior midfielder Paige Duncan ended hope of any Phoenix rally with a goal from close range off a pass from Montalbano. Towson outshot Elon 15-10 in the first half and held a 6-5 ground-ball advantage, but led, 7-1, going into the break. Cha got the Tigers started in the second half, moving into the circle and beating Ramirez to make it 8-1 less than two minutes into the period. The game was scoreless through the next 13 minutes, until Duncan cut into the middle of the circle and scored to move the lead to 9-1. Senior attacker Taylor Moore scored before another Elon to move the score to 12-2 at the final whistle. Raymond said this win was a step forward for her team. Towson will be back in action Tuesday, when it travels to face crosstown rival UMBC. The game is set to start at noon.